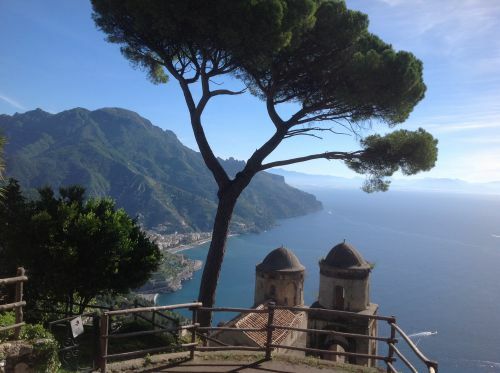 We’ve been to the Amalfi Coast twice now. The first was during a driving holiday in Italy and it was an unnerving experience for a number of reasons. I was driving along the freeway near Salerno, when we exited a tunnel at 130km per hour to find our turnoff immediately on our right! I braked furiously as I took the turn, downhill, finishing with a jolt at the T intersection! Just as well we have strong hearts! To steady our nerves we called in to a parking bay nearby where a van was selling drinks and snacks. Coffee – no problem. Tea – well have you ever had a cup of frothed milk like a cappuccino with a teabag in it? It was grey and undrinkable. This was not a good start to Vin’s birthday! Needless to say he drove from this point onwards. The coast road is the other unnerving experience. A winding narrow road with precipice drops on the one side and sheer looming cliffs on the other and no side roads worth the mention. There is the occasional small widening at the precipice verge if you are keen to stop and take a photo – at your peril! 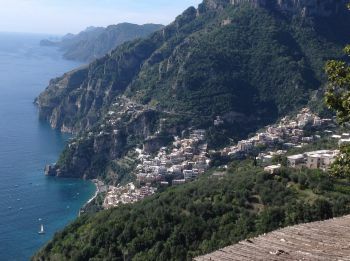 The town of Amalfi sits in a ravine between the headlands and has some flat expanses for the beach and car parks, but the moment you head out of town there is an arch in the cliffs which is no bigger than a bus – and the bus gets priority. In fact the winding roads are so dangerous that the bus will sound its horn as it approaches a bend so that oncoming vehicles can halt to allow it room to manoeuvre. Even the little motor bikes and scooters toot as they overtake to warn you not to veer from the straight and narrow. They do not consider they need any more than the width of the median line as they overtake in the face of oncoming cars. Although the views are superb, driving the coast road is not a feat we want to repeat. We stayed in Sorrento (near Sant’Agnello village) for a few days in a B&B that was also a cooking school – Mami Camilla’s. In the evenings we were lucky to be able to join the students in eating the products of their labours. 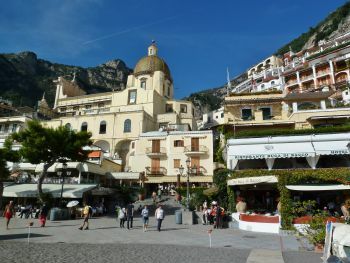 Sorrento is quite touristic but also a lovely town to walk around and with quick access by ferry across to Capri, which we took advantage of. It was a very warm summer, so we tried swimming at both places. 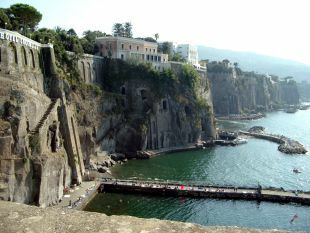 The beaches of Sorrento are grey volcanic sand and apart from the city beach/marina, only accessible down cliff-side stairs or tunnels. Pontoons or swimming platforms are provided for seating and a charge is levied for the use of many of them. Capri’s beaches, on the mainland side, are all stones and pebbles – quite uncomfortable for walking or lying on. I admit, we Aussies are spoiled for beaches. The elevated centre of the island of Capri can be reached by taxi, bus or via the funicular railway, as we did. 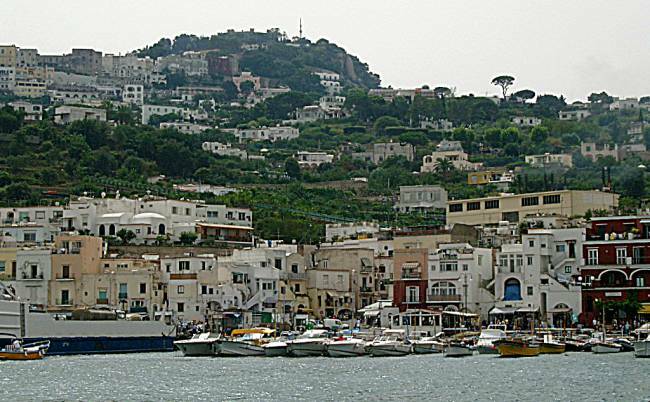 Here in the town of Capri the designer fashion stores, luxury boutiques and fancy restaurants are certainly worth a look. From Anacapri, further up, a chair lift takes visitors up to Mt Solaro. 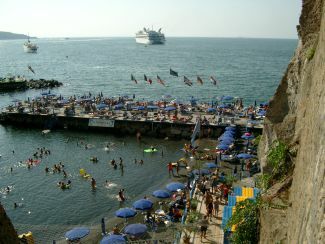 The other popular tourist activity is to visit the Blue Grotto. Unfortunately this remarkable sight is only visible on a day with little cloud and we were not going to be able to see it. 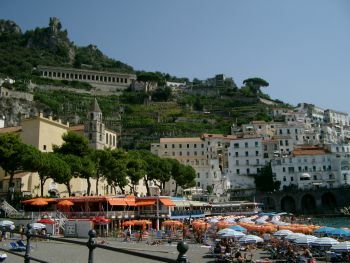 Our second trip to the Amalfi coast was during a cruise. This time we were wise enough to engage the services of a tour company whose little bus took six of us the inland route from Naples to cute little Ravello, with its glorious views from high above the coast and then on to Praiano and the wonderfully picturesque Positano, before taking the coast road back to Naples. On both the way there and the way back we were forced to take long detours to avoid road blockages caused by car accidents as there are so few roads in the area. The coast road only has a couple of side roads in its entire length allowing access to the routes inland. 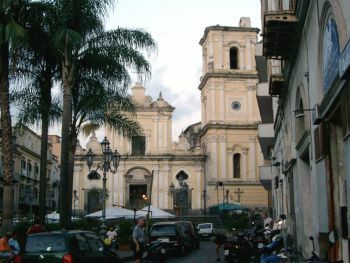 It made our trip quite lengthy and caused us much anxiety on our return journey to Naples port in case we did not make it back to the ship in time. Thank goodness the tour driver knew the roads well. We had briefly stopped at Positano on our earlier trip, but finding somewhere to leave the car in order to go exploring was almost impossible. This time we were going to make the most of it. We had booked in to La Tagliata Restaurant high on the terraced roadways above the town – a place with authentic family style food and spectacular views. We were not disappointed. The food was varied and delicious and more than we could eat. Then we had time to browse the lanes and shops of the town and spend some time exploring the beach-side area. We found a beach bar where we caught up with our emails courtesy of the free wifi while we ordered a couple of iced coffees. This cannot be an Italian concept as we were presented with two macchiatos which were simply cold! 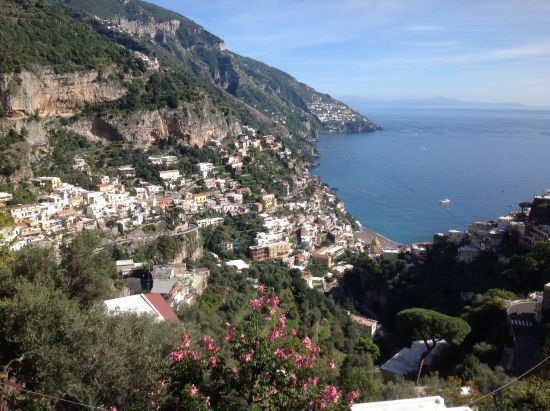 Nevertheless, Positano would rate as one of my most favourite Italian towns.